The Chesapeake Bay region is currently experiencing some of the highest relative rates of sea-level rise within the United States, up to 5.8 mm/year (0.23 in/yr). Natural resources and built infrastructure in both metropolitan and rural areas are experiencing direct impacts of rising tidal water levels including inundation and salt intrusion. The National Oceanic and Atmospheric Administration (NOAA) has initiated a Sentinel Site Program (SSP) to encourage federal, state, and local partners to cooperatively address impacts of climate change, with an initial emphasis placed on rising sea levels. 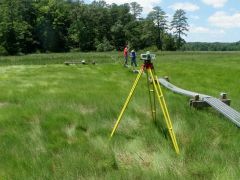 In 2011, NOAA selected Chesapeake Bay as one of 5 initial regional Sentinel Site Cooperatives (SSC) to demonstrate the value of using a place-based approach to address issues of local, regional, and national significance. The sentinel site network strategy will leverage existing assets, programs, and resources; additionally, targeted investment from multiple groups at similar sites will dramatically increase the effectiveness of these efforts. 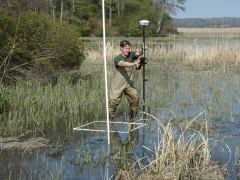 The Chesapeake Bay SSC represents a partnership effort to integrate existing science agencies, academic institutions, and other organizations with the capacity to synthesize data concerning living resources, water quality and geospatial monitoring. The purpose of this partnership is to increase understanding of environmental and socioeconomic changes attributable to sea-level rise and apply that information in a timely manner to address interests and management concerns with respect to the Bay's living resources and coastal communities.